in front of a vacuum machine for the Lucalox® lamp, 1962. "He was destroying things as soon as they were made." "He couldn't make them tough enough." Lighting inventors had known for years how to improve the color output of a sodium lamp: raise the sodium's pressure. Sodium is very corrosive however, and attempts to build a lamp that could contain higher pressures failed until the development of a new ceramic material in the 1950s. Polycrystalline Alumina (PCA), or Lucalox® as it was named by General Electric, made a high-pressure sodium lamp feasible. Manhattan Project veteran Joseph Burke lead the development team at GE's Schenectady Lab that included ceramicist Robert Coble. With the new material sufficiently developed, work began at GE's Nela Park to make a lamp. Engineer William Louden and physicist Kurt Schmidt soon discovered that PCA was rather exotic. It would not flow like heated glass, so sealing PCA tubes became a major challenge. Eventually, Louden turned to an equally exotic metal, niobium (element #41), which would adhere to the PCA at high temperatures. Many experiments were needed to make seals which would last long enough for a practical lamp. Hence the half-joking exchange between the inventors noted above. Louden explained in a 1996 interview, "My seals were being destroyed by Dr. Schmidt, who had to test all of these structures at different wattage ratings, different power inputs, different temperatures, and consequently a lot of them wouldn't stand it. He found out quickly that the seals let loose and were destroyed. Of course this, while frustrating to me, was a necessary part of the research. But still, it was an item that caused a lot of friction between us because I thought he was giving my seals an undue test and yet he thought he was giving his lamps practical tests." A part of learning how to engineer the new materials included making new equipment. 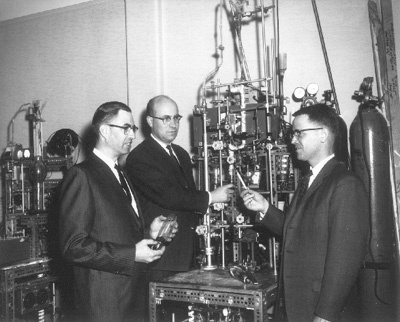 The photo above shows Louden, Schmidt and Ernest Martt (their manager at GE) standing in front of a vacuum machine developed at Nela Park by engineer Casey Freeman.